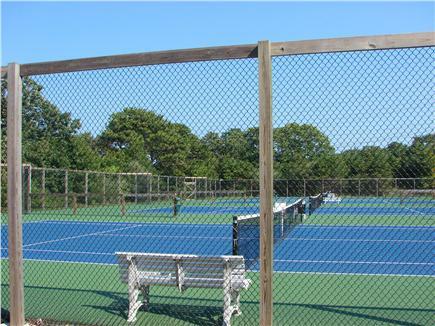 Tennis Courts are available for you to enjoy! Linnell Landing Beach is one of several Bay Beaches so close by! 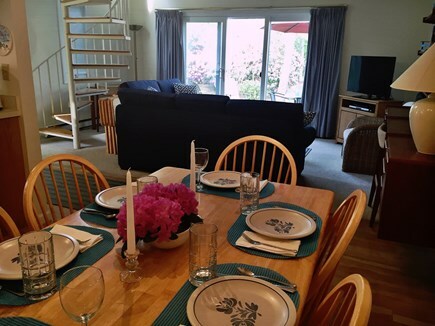 Escape and enjoy our air conditioned 2 bedroom plus loft, 2 bathroom townhouse at Ocean Edge. 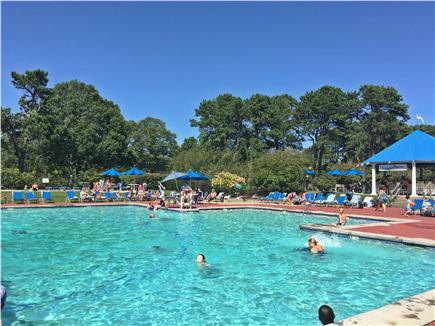 Sports Membership allow privileges for 2 outdoor swimming pools, 1 indoor swimming pool, hot tubs, fitness center, tennis, basketball courts and all activities that this premier Cape Cod Resort has to offer. 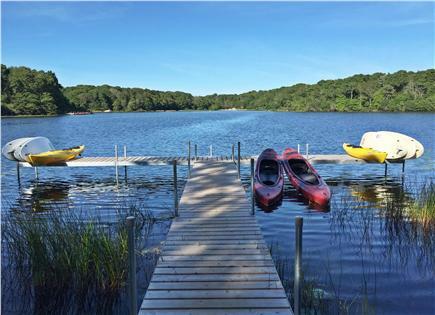 Easy access to Cape Cod Rail Trail and choice of several Brewster Bay beaches nearby. 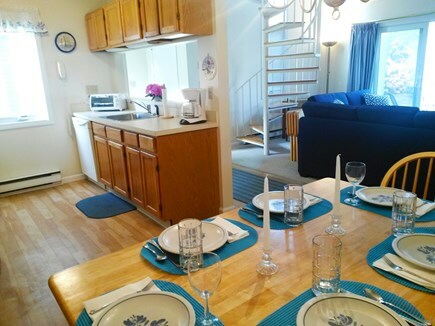 Our welcoming townhouse has high speed internet, three televisions, spacious 'L'-shaped living/dining area with skylight, fabulous loft area and a fully-equipped galley kitchen. The living room sliders feature a wonderful view. 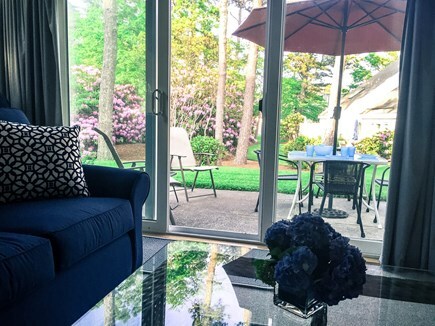 They open onto a private patio for relaxing or outdoor dining and overlook a lovely courtyard. 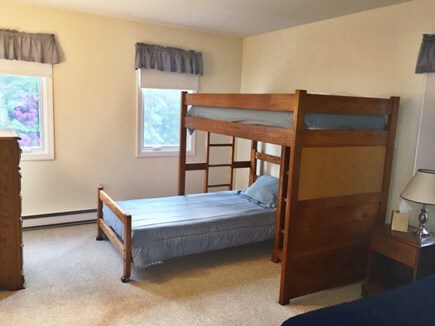 The master bedroom downstairs has a queen bed; and the second bedroom upstairs has a twin bed and a set of bunk beds. 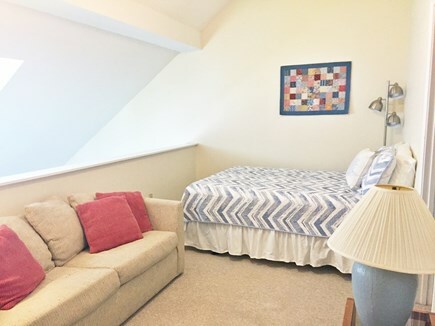 The loft area provides extra living space with queen bed and couch. We offer a nice selection of board games with family favorites such as: Monopoly, Life, Chess, Checkers, Trivial Pursuit, & cards. Additional pricing info: Pool Passes Available at tenant's expense, State and local taxes of 14.45% will apply. Our Happy Place in Brewster! This is the third year in a row that we have stayed in John and Lauren's Ocean Edge home, and it really is a perfect fit for our family. We can count on the townhouse being spotless when we arrive, and well stocked with everything we need to cook and eat in on the days/nights we'd rather not dine out. John and Lauren have really thought of everything, and made sure that it's provided. 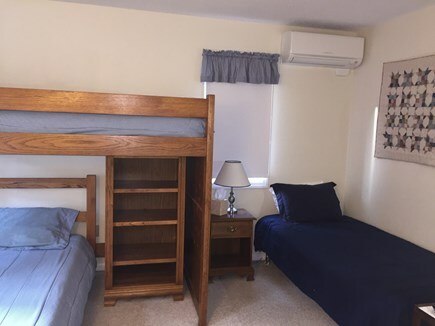 That includes guides to local attractions and restaurants; instructions for using all of the major appliances; as well as a trove of books, games, and other items, all designed to make one's stay more pleasant. 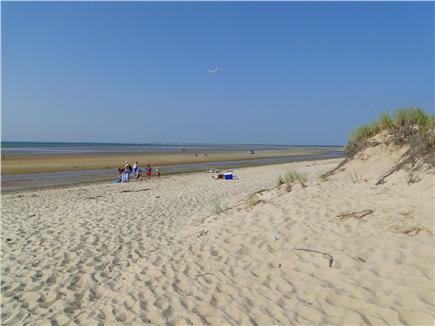 The location is ideal, central to a variety of beaches, as well as numerous attractions for young and older children. Plus, Ocean Edge has a lot of events right on site, such as movie nights, kayak rentals, and beach fires on Bay Pines Beach where you can watch the sunset, or roast marshmallows and make your own S'mores. You could easily spend a week here, if you chose to, without ever leaving the property. 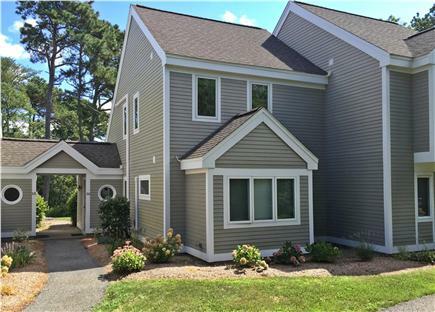 My wife and I have rented this condo in Brewster with our boys for a couple of years now. 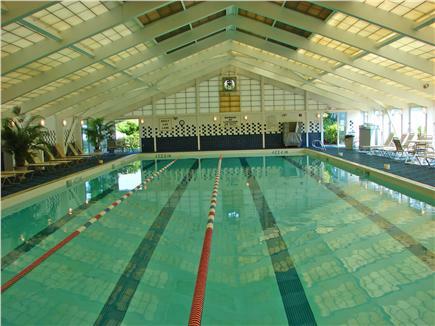 It is located at Ocean Edge, which has plenty of pools including an indoor pool for the kids. The condo is spotless and owners are so easy to deal with. 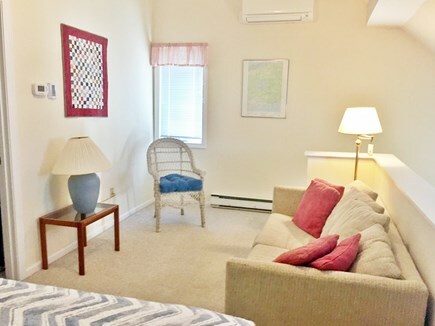 The location is also perfect for beach get aways throughout Cape Cod. The resort also offers a lovely private beach if you prefer to stay local. What can I say. It’s the Cape and it’s marvelous. Do not have one negative thing to say! Enjoy! We had the pleasure of staying in this home for 2 weeks! It was an absolute pleasure. 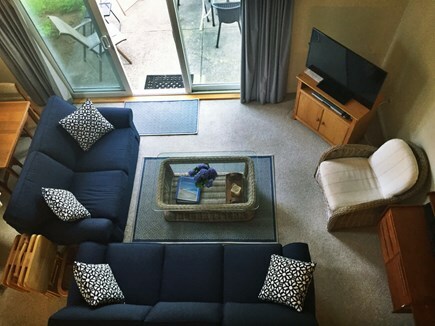 Beautifully maintained, well appointed and enough room for everyone to enjoy our time in Ocean Edge. We have stayed at Ocean Edge before in other units, but this was the nicest one we've stayed in. It's been updated, is comfortable and well stocked. Our 2 young children enjoyed it as well. The owners were very accessible and easy to communicate with. They are clearly experienced in rentals and it shows with the care and efficiency that went into the process. Having access to the pools was fantastic. We had a great time and would come back again in a heartbeat. I especially appreciated the updates to living room furniture, the renovated downstairs bathroom, and new queen mattress which was very comfortable. Also appreciated was the fully-stocked kitchen, which literally had everything we needed! 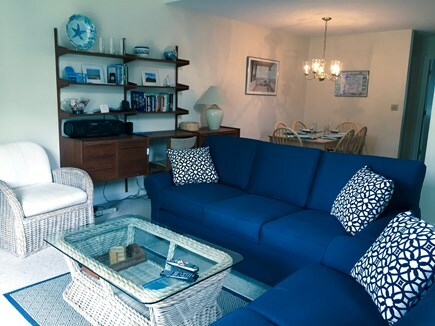 A minor point, which added to the overall convenience of the condo, was the addition of multi-prong electrical jacks and extension cords to handle charging of phones, placement of fans, etc. Another factor that indeed came in handy was the location of the condo very near the exit to the resort, thereby making travel outside Ocean Edge quite easy. This was our second year renting John and Lauren's Ocean Edge townhouse, and I suspect next summer will be our third. 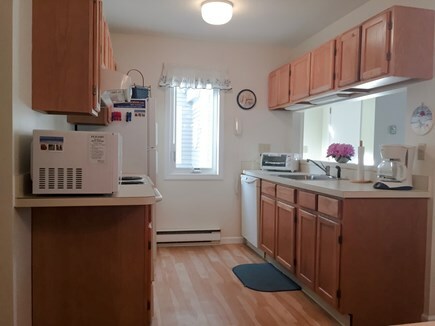 The property is clean and well lit, with lots of natural light. 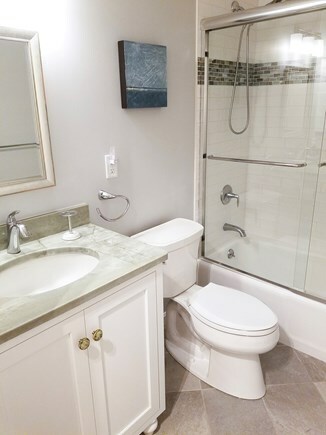 Clean is important to us, and we always find their home spotless upon arrival. The kitchen contained everything we needed to cook and dine in, which we did most mornings and a few evenings. The outdoor patio area was lovely as well, the perfect place to enjoy a quiet cup of coffee. I also have to point out, that while no one wants to do laundry while they're on vacation, having a washer and dryer in the townhouse was a huge convenience. We had a great week weather-wise, but the owners were kind enough to stock their home with a variety of rainy day activities, such as puzzle books, decks of cards, and a nice assortment of reading material. 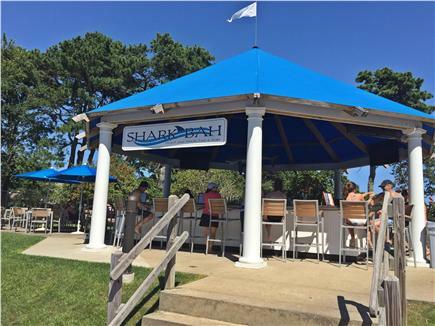 They also provided information on local beaches, area attractions, and dining options. We came back for another stay in this lovely home on the Cape. 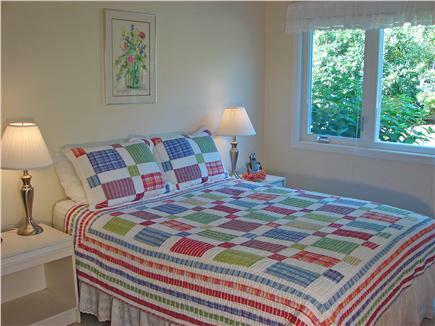 It is cozy and well maintained with enough space for our family of 5. Our 3 boys (9, 9, and 12 years old) enjoyed the stay as much as last year with a lot of activities to do around Ocean Edge and near all the beaches of the National Seashore. Thanks again, Lauren and John, for this wonderful stay, and we hope to come back next year! 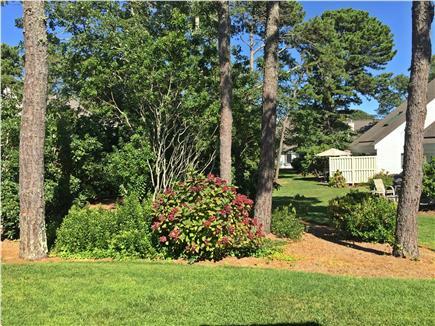 Wonderful townhome at Ocean Edge! Loved the townhouse! Perfect for our family, as the kids were able to have the second floor to themselves. 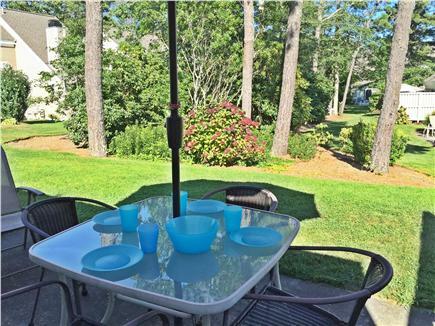 Awesome location with close access to beach, pool access passes available and basketball/tennis courts. Enjoyed Cape Baseball games, mini golf, bike trails and caught the Orleans 4th of July parade. 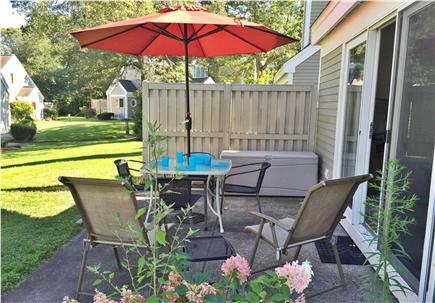 Perfect Cape vacation, and loved the convenience this townhouse offered.